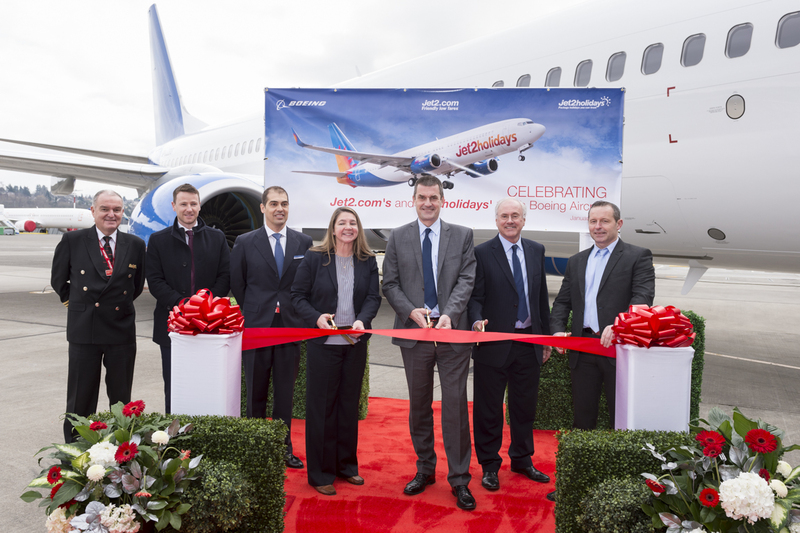 Jet2.com and Jet2holidays has marked a major milestone when it took formal delivery of the last of 34 brand new Next Generation 737-800 aircraft from Boeing – taking the number of aircraft in its fleet to 100. 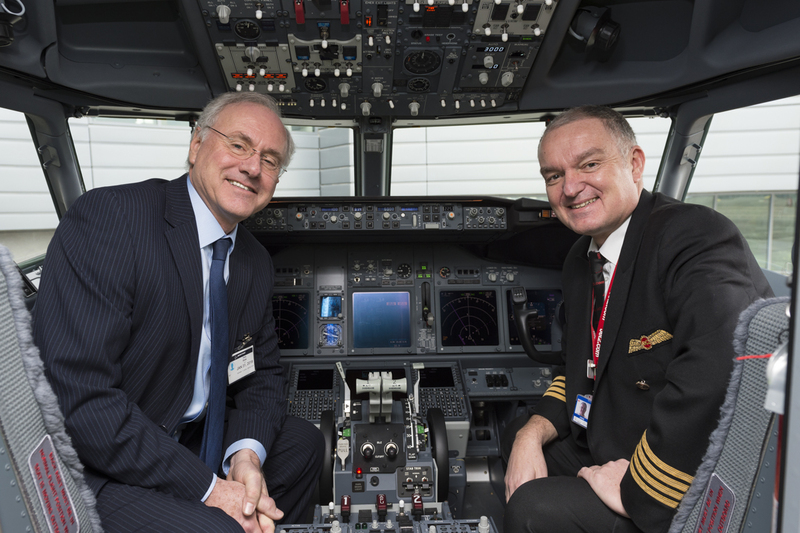 The brand new aircraft, which seats 189 passengers, was handed over to Jet2.com and Jet2holidays at a ceremony at Boeing’s Seattle Delivery Centre in the United States. The aircraft will fly to the UK this week, where it will be fitted with special finishing touches, including bespoke seating, before coming into operation in the next few weeks. Six lucky winners joined the celebrations, after winning a social media competition hosted by Jet2.com and Jet2holidays. Tyler and Declan Adams from Bishop Auckland, Gareth Brown and Amy Anderson from Edinburgh, and Mark Jones and Nicholas Heyes from Cheshire, were chosen from more than 2,000 entries after submitting a video entry explaining why they deserved to win a place on a once-in-lifetime four-night trip to Seattle. This newest aircraft is the final one of 34 brand new Boeing 737-800NG aircraft which Jet2.com and Jet2holidays has brought into its fleet since September 2016. The aircraft have an approximate list price of $3.3 billion, however the company has negotiated significant discounts from this price. The fleet of new aircraft enable the company to continue its growth and development strategy, meaning it can fly more package holiday and flight-only customers to sunshine, ski, and city destinations across Europe, the Canary Islands and the Mediterranean. As well as Jet2.com being the UK’s third largest airline, Jet2holidays is now the second largest tour operator in the UK. The company’s flight-only product was enjoyed by 5.37 million passengers in the last financial year (year ‎ended 31 March 2018), a growth of 48% year-on-year, whilst demand for ATOL protected package holidays continues to grow, as Jet2holidays took 2.5 million customers on real package holidays, an increase of 45% year-on-year. In total, the company flew 10.38 million flight-only and package holiday passengers (one-way) in the last financial year (year ‎ended 31 March 2018), and this combined leisure travel business increased revenues by 42% to £2,223.2m. This growth is set to continue, with over 12 million seats and three new destinations (Chania in Crete, Bourgas in Bulgaria, and Izmir in Turkey) on sale for Summer 19 from across its nine UK bases – a capacity increase of 15%. As well as supporting the company’s continued growth, the new aircraft will also enable Jet2.com to make further product improvements in line with its family friendly ethos. This continued investment into delivering a VIP customer experience has seen the company win a number of high profile awards, such as TripAdvisor Best Airline – UK for the past two years running, 7thposition in TripAdvisor’s Top Airlines of the World, and Which? Travel Brand of the Year 2018. 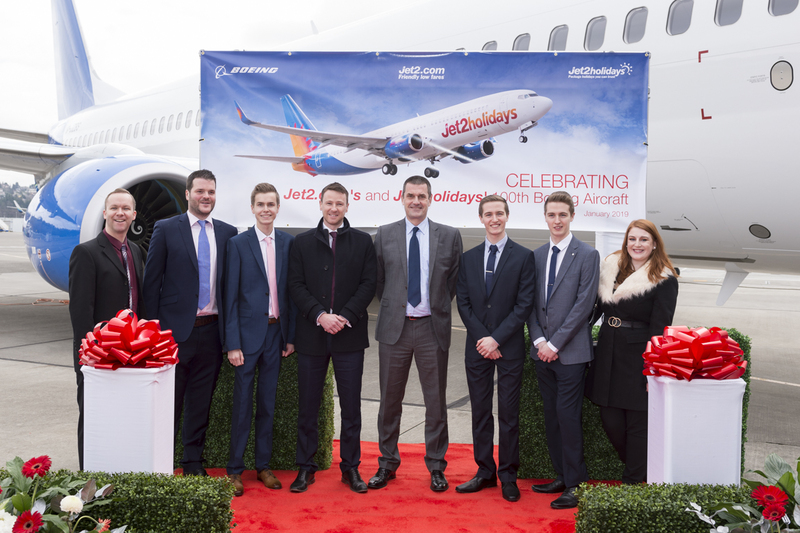 Steve Heapy, CEO of Jet2.com and Jet2holidays said: “The arrival of the 100thaircraft into our fleet is a momentous occasion and demonstrates the confidence we have in our growing business. Operating a fleet on this scale means we can continue to increase capacity, offering holidaymakers more choice and flexibility than ever before when it comes to getting to Europe, the Canary Islands and the Mediterranean. The delivery is the latest stage in the growth story of Jet2.com and Jet2holidays since flights began from Leeds Bradford Airport in 2003. Since then, the company has expanded to become the 3rd largest registered airline in the UK, providing friendly low fares to more than 70 sun, city and ski destinations across Europe. Through Jet2holidays the company also offers great value ATOL protected package holidays to over 500 resorts with thousands of 2-5 star hotels available. 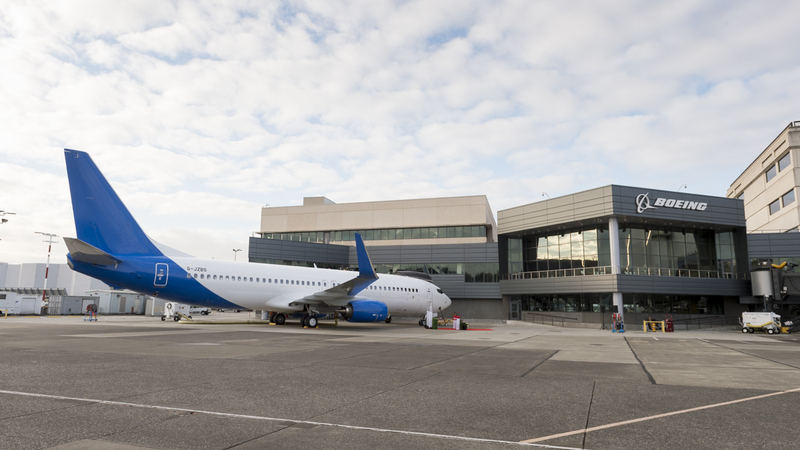 The Boeing 737-800 is part of the successful Next-Generation 737 family. It is known for its comfort, reliability, fuel efficiency and advanced engine and wing technology. The aircraft can fly approximately 3,000 nautical miles (5,500 km), up to 900 nautical miles more than earlier 737 models and 175 nautical miles (320 kilometers) further than competing aircraft. It also consumes 5% less fuel while carrying more passengers than competing aircraft. The aircraft uses years of research to provide more comfort for passengers, and features the 737 Boeing Sky Interior which includes sculpted sidewalls, a window design that draws passenger’s eyes to the windows, and a cabin design that offers more openness and extra leg room. For further information, please visit www.jet2.com or www.jet2holidays.com. Jet2.com is a leading leisure airline providing friendly low fares to over 70 exciting sun, city and ski destinations across Europe. It operates from nine UK airports: Belfast International, Birmingham, East Midlands, Edinburgh, Glasgow, Leeds Bradford, London Stansted, Manchester and Newcastle. Jet2.com prides itself on offering award winning customer service, friendly flight times, allocated seating and a generous 22kg baggage allowance. Jet2.com is the 3rdlargest registered airline in the UK and in Summer 19 it will operate a fleet of 100 aircraft. Jet2.com was named Travel Brand of the Year 2018 at the Which? awards, and Jet2.com was also awarded byWhich? with their prestigious ‘Recommended Provider’ status in its annual Airline Survey for three consecutive years (2016, 2017 and 2018).Jet2.com has been awarded Best Airline – UK and Best Low-Cost Airline – Europe for two consecutive years in the TripAdvisor Travellers’ Choice awards for airlines. In the 2018 TripAdvisor Travellers’ Choice awards, the airline was also awarded Best Economy Class – Europe and was recognised as one of the ‘Top 10 Airlines in the World’, coming 7thin the prestigious list. The airline has also won UK’s Most Loved Airline as voted for by users of Skytrax, Best Short Haul Airline at the Globe Travel Awards (2012, 2013, 2014, 2016, 2017, 2018 and 2019), Airline of the Year at the Glasgow Airport Awards (2016), Best Holiday Airline at the Scottish Passenger Agents Association Awards for seven consecutive years (2011-2018), Best Airline at the Graftas (2016), Best Airline at the Northern Ireland Travel & Tourism Awards (2018), Best Airline Europe & North Africa at the Selling Travel Awards (2018),and Best Airline at the Group Leisure Awards (2012, 2013, 2014, 2016). In 2017, Jet2.com was the only UK airline to be awarded 5-Stars for On-Time Performance by OAG, the world’s leading air travel intelligence company. In January 2018, the benchmark UK Customer Satisfaction Index (UKCSI), produced bi-annually by the Institute of Customer Service, named Jet2.com 29th out of almost 250 companies for customer service. This makes Jet2.com the highest ranked airline for customer satisfaction in the study. In March 2018, Jet2.com was awarded with a Trusted Provider Award by Feefo, for providing customers with an exceptional booking experience both online and through its UK call centre. Jet2holidays is the UK’s second largest tour operator and provides great value package holidays you can trust to more than 500 resorts across the Mediterranean, Canary Islands and Europe. Jet2holidays wraps everything up in one great package. Customers have a choice of thousands of 2-5 star hotels, with Jet2.com flights, an industry leading 22kg baggage allowance and airport transfers included. Infants go free on all holidays and all holidays can be secured with a low £60 per person deposit. With a UK based call centre, and the option to book online or over the phone, Jet2holidays customers also benefit from 24 hour assistance in resort. Jet2holidays has won a range of awards, with the most recent ones including: Travel Brand of the Year 2018 at the Which? Awards, as well as Best Short Haul Operator (2016, 2017, 2018 and 2019), Favourite Short Haul Operator (2018), Best Trade Sales Team (2019) and Best Trade Friendly Brand (2018) at the Travel Weekly Globe Awards. Jet2holidays has also won Best Short Haul Operator (2018) at The Sun Travel Awards, Best Overall Operator (2014, 2015, 2016, 2017) and Best Mainstream Short Haul Tour Operator (2015-2018) at the Scottish Passenger Agents’ Association Awards, Best Package Tour Operator and Best Internet Booking System (2015, 2016, 2017 & 2018) and Best Sales Support to the Northern Ireland Travel Trade (2015 & 2016) at the Northern Ireland Travel & Tourism Awards, Best Family Holiday Operator (2018) & Best Short Haul Operator (2017) at the Travel Bulletin Star Awards, Best Tour Operator at the Graftas (2016, 2017 & 2018), Best Tour Operator Europe & North Africa at the Selling Travel Awards (2017 & 2018),Best Group Tour Operator – Short Haulat the Group Leisure & Travel Awards (2018), Best Trade Team at The Travel Network Group Conference (2017), and Leisure Sales Team of the Year (2017 & 2018) at the Advantage Travel Partnership’s Big Celebration Lunch. In January 2018, the benchmark UK Customer Satisfaction Index (UKCSI), produced bi-annually by the Institute of Customer Service, named Jet2holidays 9thout of almost 250 companies for customer service. This makes Jet2holidays the highest ranked tour operator for customer satisfaction in the study. In March 2018, Jet2holidays was awarded with a Gold Trusted Provider Award by Feefo, for providing customers with an exceptional booking experience both online and through its UK call centre. Jet2CityBreaks is Jet2holidays’ dedicated city breaks product launched in May 2015. In 2016, Jet2CityBreaks was awarded Best European Short Break Provider at the Scottish Passenger Agents’ Association Awards. Jet2CityBreaks provides Jet2.com flights and handpicked hotels in more than 26 of Europe’s most popular cities, all secured with a low £60 per person deposit. All Jet2CityBreaks are ATOL protected. Jet2Villas is Jet2holidays’ dedicated villa holiday offering launched in May 2017. Jet2Villas offers the freedom of a villa holiday with the full package – a £60pp deposit, as well as 22kg baggage, 10kg hand luggage and great flight times as well as car hire included as standard. All Jet2Villas holidays are ATOL protected.